genre, as it should be. I also believe that horror is different depending on where you are in your life. What’s represents horror for a twenty-year-old might be old-hat to a forty year old. Books that resounded for me in my twenties are just “eh” now that I’m a lovely seasoned woman of a certain age. 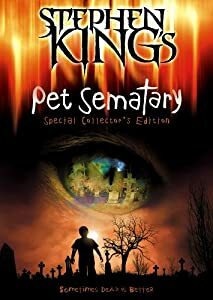 But Stephen King’s Pet Semetary broke that mold. It’s just as frightening now as when I first read it many years ago. “Sometimes dead is better….”When the Creeds move into a beautiful old house in rural Maine, it all seems too good to be true: physician father, beautiful wife, charming little daughter, adorable infant son — and now an idyllic home. As a family, they’ve got it all…right down to the friendly cat. But the nearby woods hide a blood-chilling truth — more terrifying than death itself…and hideously more powerful. My goodness, what a story. It runs the gamut from the “real-life” horror of the death of a child and the grief that follows, to the otherworldly horror that awaits when the family tries to alleviate the grief that follows the death of a family pet. The first time I read the story the scene on the hill wasn’t so horrifying. You know why? Because I didn’t have children of my own. I think I was more touched by the death of the pet than I was by the other. However, when I read it now, that scene on the hill makes my gut twinge and jump. After reading it, I had to go “check on the children”. Having children of my own makes the following scenes more poignant and so much more touching. My theory of horror if you’re “just watching” it makes it a lot less scary. “This could never happen to me because blah blah”. When an ordinary situation turns into a “horror” situation, something that could happen to anyone, something that is plausible (with a little “what if” thrown in) that’s when the true terror begins. Pet Sematary is about grief, loss and at its core, the horror of not letting go and where it can get you.